When you are shopping for farmhouse lighting, consider how you are using your space. Do you need bright lighting, such as for an office or a kitchen? Bright lighting helps you to focus on your tasks and to show off spaces which are frequently used during the daytime hours. Or would ambient lighting better suit your needs, such as for a bedroom, living room, or even a dining room space? Our light selections cover the gamut, from distressed farmhouse lighting fixtures to quaint, French-style decor which is both beautiful and functional. Our pieces fit perfectly with your existing style; with our understated, streamlined selections, they are sure to be in style for years to come. 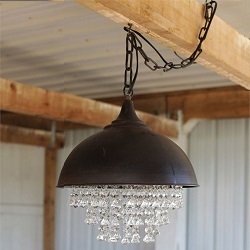 The designers at Antique Farmhouse have put together an incredible collection of light fixtures, sure to suit your preferences and complement your living space with ease.